Another beautiful addition to our realistic logo mockup collection designed by graphicpear. 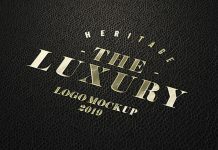 Easily place your logo design, logotype, typography on smart object, change the premade photo effect by hide/unhide from the photo effects folder. After placing your artwork save and close that window to receive a super realistic outcome. You will receive a beautiful depth of field and premium look to your logo design.